I’m not sure I’ve ever found such universal praise in a long time for a local album—I end up in lot of discussions with people in the press and the local music community and a lot of times things can get negative or weird or we just have different opinions (yes, I’m known for liking everything, but maybe re-examine who I haven’t written about). So, when I got an early release of Saddles Shell Art, I gave it a listen and was kind of blown away—now for the last month or so, from other people in the press or within the industry in some capacity, the main question I greet with a smile is “Have you heard the new album by Saddles?” They deliver this question with wonder and awe. And it’s definitely not for lack of merit—I can see why over a dozen people have been prompted to ask about it, send it to me, share it with me, make me aware of it. It’s simply a great album and I’m not surprised that people who are either musicians or so embedded in the scene that it’s simply a stunner. It also may be one of the best albums of the year. Saddles is the work of Charles Barth and George White. They made a fairly large splash in 2009 and again in 2011—but nothing they’ve done before compares to this…no one was shaking me down during those years demanding or simply making sure I had heard the album. 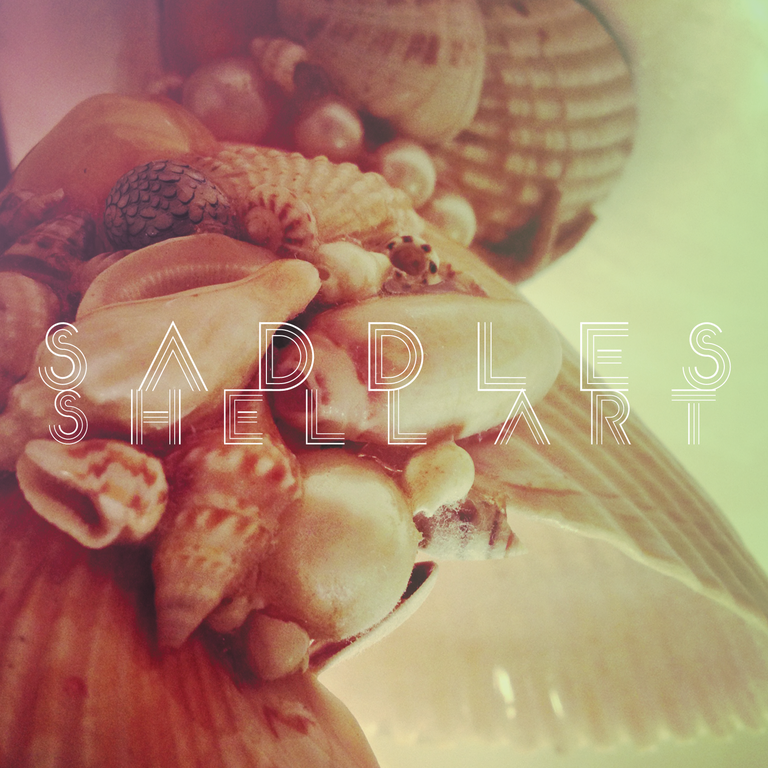 Saddles new album Shell Art feels like it has come out of nowhere, because it seems like it has. It appears this powerful duo has spent the last two years of their lives constructing something unlike what they have previously presented, something new, great and different. The day I got it, I listened to it at least three times, when I heard other people talking about it, it occurred to me that everyone had spent as much time with it out of compulsion—because they had to, because when you hear something that is so different from everything else going on, you just feel kind of rewarded, you feel like it’s a present the scene has delivered to your ears and that’s what you will feel like when you listen to Shell Art by Saddles. If you are not immediately drawn in by “The Original”, I’m not sure what can explain that. It starts as though you might be headed into a thin electronica album before it becomes something orchestral and beautiful—seriously, tinny sounds, synthesizer, drum machine, but at the same time, you keep listening—then the vocals start. Still minimalist, but when the rest of the music comes in you grin and realize you might have to stay for the whole show. The damned thing turns into a cosmic gospel choir by the end—think Polyphonic Spree without the robes or the cult feeling. The topper is perhaps the finale verse, when it is revealed the psychic destruction of the conflict found within the entire song, “So I’ll be filled with jealousy when I see all the faces aglow in a row. All the while, bellowing a melody that they’ll never know you stole.” It ends with radio static and proves to be as brilliant in construction as it is in melody and harmony. “The Holes In Our Throats” only maintains the pace and brilliance of the album opener. It totally opens like a classic New Order song, not in a plagiaristic sense, but in homage. This may what be what makes this such a great album—there are references here, but they don’t come off as unoriginal, they come off as homage only. Once more, Saddles saves the one-two-punch for the finale, “I saw you peeking through the bushes at me. The kids are setting fire to the streets. And you were speaking like the devil through me . While we were hand in hand and glued to the screen. And we were screaming only just out of reach While they were singing only just out of key. Yeah we’re believing everything that we read, But we’re not reading anything that we see.” It’s undeniably powerful material lyrically, but musically it’s matched syllable for syllable. 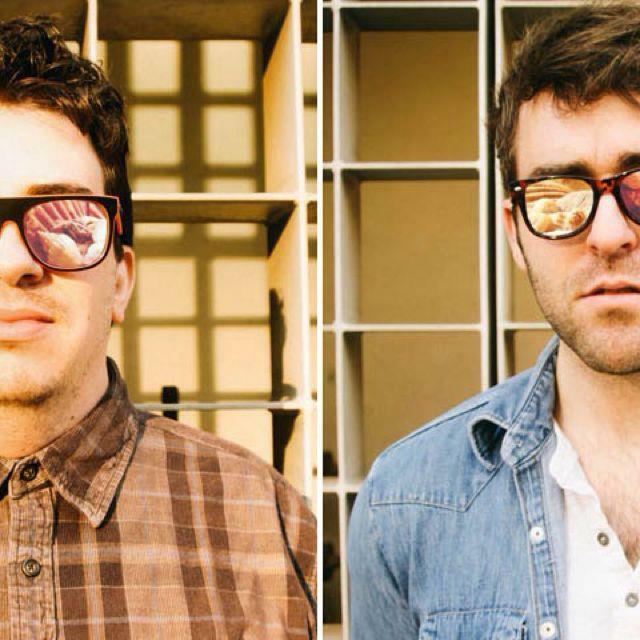 The indie rock aesthetic of “Not Sally” is simply brilliant; there is no way around it. There is a serious feel of a unilateral love affair going on here—I can’t be sure, but I can relate to it because I’ve felt myself in this situation and that’s why I can relate to this. It’s a tremendous song of misunderstanding and regret, of insecurity and resolve, it’s self-questioning, maddening. You find someone that is who you think may be the perfect match and it turns out that your past deficiencies have already decided their lack of interest in you—not because of anything they may now, but just how you are and how they interpret you. “Interlude” follows and serves as a constructional coda for what is, perhaps, the most emotional piece on the entire affair. “Cancer Dance” could, and I’m not exaggerating here in any capacity, well be an outtake from a classic Depeche Mode album—maybe Black Celebration or Music For The Masses. The only thing that departs it from the asaid reference is the impassioned chorus and the choir of voices emerging from there—yeah, it’s better than Depeche Mode, and while it’s better than anything they ever did, in light of the brilliance found on Shell Art, it does sound a little thin. Again, though, it’s the lyrics that drive it home, “We’ve always known these things would kill us. I know you’d rather be wrong than ignored. We’ve always known these things would kill us. I see it turning you on even though we’ve always known these things will kill us.” In this case and it’s the only example on the album, where the lyrics save the song, because they are more powerful than the song itself. Point to regard, at their thinnest, Saddles sound better than Depeche Mode. There is something amazing about the soft wonderful vinyl introduction to “The Wrath Of God,” well, there is something beautiful about the entire song. The sound of the vinyl later becomes waves lapping at the shore—not literally, but that seems to be the transition in sound. It is a wonderful acoustic number, until it explodes in the end with trumpet and cacophony. Then it’s even better. Through bitterness, tears, and footsteps, the refrain remains, “So my fears still warm my sheets as I read of streets she walks. And I’m careful not to leave, ’cause I love her desperately.” It sounds like a garage door opens, a car door opens and closes and you are brought to the finale of “Brothels” which may be something so perfect, finale or otherwise, that it makes you immerse yourself completely in the sound. It is clearly, the finale—something that sums up the insecurities of the songwriter, something that sums up the entire album, finishes it with all the beauty, trouble and romance that consumes the entire affair. I’m not going to go into the lyrics here, they are too personal for either me or Charles , the songwriter—let it just be said they are heavy. The choir vocals that end the song are the perfect outro for an immaculate album that deserves them. I’d like to say I find some fault in the album, but I can’t and I know it’s not my style to do so, but I wanted to, the truth is that this album should go national. The truth is, I’m going to make every effort I can to make sure it does, that’s how much I believe in Saddles Shell Art. 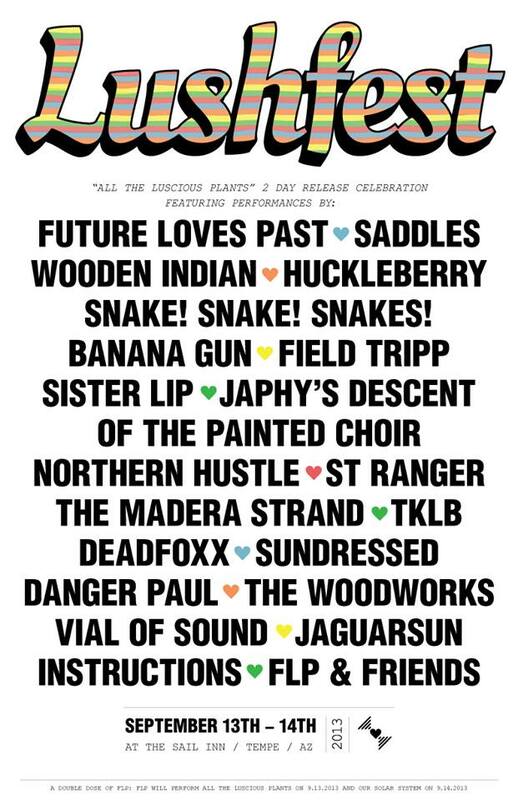 Be sure to check out Saddles this weekend at Future Loves Past’s “LUSHFEST” at the Sail Inn. They take the inside stage on Friday at 10pm! For more information on this amazing two day musical eargasm check the links and flyer below.